180 is an energy drink brand produced and distributed by Anheuser-Busch of St. Louis, Missouri. The beverage is the only non-alcoholic energy drink to be produced by a beer company. The original formulation is Energy Orange and has a lightly carbonated, orange-citrus flavor. Other varieties include Sport Water billed as "the mother of all waters" with niacin, zinc and Vitamin C and some B vitamins, 180 X-3 (low cal, low carb lemon-lime flavor) and the grape-blueberry-flavored 180 Blue with Acai (a grape-sized berry with B vitamins, minerals, fiber, proteins and Omega-3 fatty acids) and guarana. The 180 website has an animated "energy molecule mascot" named Flip, and offers free downloadable wallpapers, ringtones, media skins and a game of "Dodge Brawl" that users can play online or download to their cell phones. 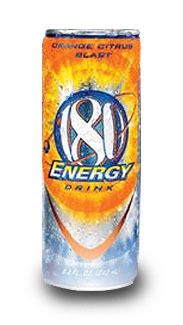 Slogan: Flip your Energy-Taste a 180!